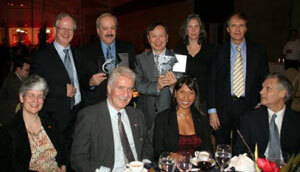 November 27, 2009 - Montreal - Quebec - On Thursday, November 26, 2009, MPB Technologies Inc. and Concordia University were presented the Technology Partnership Award at the 19th annual ADRIQ Gala in Montreal, Quebec. Since 2003, MPB Technologies and Concordia University have collaborated in developing smart materials and fiber optic sensors that can potently lengthen the life time of structures. Both technologies are of high interest to the European and Canadian Space Agency. Innovative projects developing through the collaboration include a self-healing resin, that has been proven to fill randomly created cracks during accelerated aging and thermal shock tests. The next is not far off - on November 2, 2009, it was announced that CSA will help fund a new project - Pioneering of Self-healing of Damage in Composites Caused by Space Debris - where MPBC, Concordia and McGill University will work together to develop innovative self-healing concepts mitigating the effects of debris impacts. ADRIQ (the Association de recherche industrielle du Québec) is a large and influential business network which has been supporting industrial innovation and promoting partnerships in Quebec for over 30 years.